Ah, Miami Venezuelans. In their free time, when they are not dodging accusations of being participants in devious acts, they are actually … doing their job. Going to vote. Organizing rallies. And yes, protesting against that chavista tool, Democratic Senator Mary Landrieu. You’re probably familiar with Landrieu’s underhanded maneuver to protect Venezuelan human rights violators and do Citgo’s bidding in the halls of the Senate – why, there are even emails! She is so deceitful on this issue, she is even sticking up for her choice. She is even asking for the language to change – basically saying that the bill should exempt foreigners who do business with the US from sanctions, effectively making the bill toothless since all human rights violators in the Venezuelan government do business with the US. A few weeks ago, when this broke out, I reached out to the Venezuelan community in Louisiana, and they basically shrugged their shoulders. Well, at least the Miami crowd does the job the Louisiana crowd is too lazy to do. 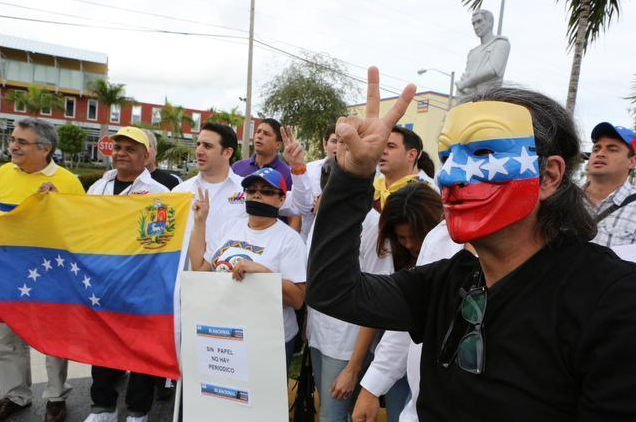 When Landrieu was in town for a fund-raiser, a group of Venezuelans in Miami let their displeasure be known. Thanks guys.